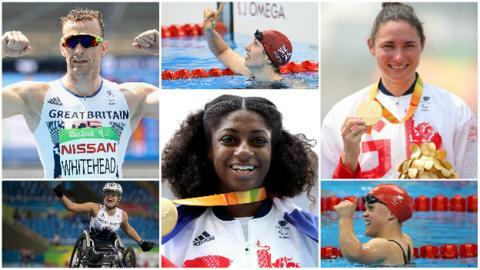 Great Britain closed the Rio Paralympics with 64 gold medals, the most by a British team since 1988. ParalympicsGB surpassed their London 2012 medal tally of 120 on day nine of the Games in Rio and finished with 147, second in the medal table behind China. They also matched the highest number of gold medal sports at a Paralympics with 11, matching China at Beijing 2008. Kadeena Cox, who won golds in athletics and cycling, will carry the British flag at Sunday's closing ceremony. The 25-year-old is the first Briton to triumph in two different sports at the same Games since 1988. "It's a great feeling to know that I'll be standing at the front of such an exceptional group of athletes from GB, to represent what has been such a successful and high-achieving team," she said. Rio Paralympics GB roll of honour - who won what? "I only originally expected just to get to Rio, let alone win medals, so to do this is the icing on the cake of an amazing Games. I couldn't have imagined this in my wildest dreams. To do something as special as carrying the flag is incredible." Penny Briscoe, chef de mission for the British team, said: "Kadeena's achievements in Rio have been absolutely remarkable, and she is the perfect choice to be our flagbearer." "To strike gold in two sports is no mean feat, and it pays tribute to her talent, pride and determination and also the work of British Athletics and British Cycling, with the support of National Lottery funding, to help her achieve and surpass her goals. "As the Games draw to a close we can begin to reflect on the exceptional performances of our athletes and this incredible medal haul. The Closing Ceremony is the perfect way to kick off the celebrations for this record breaking team. I am so proud of each and every member of the team." British Paralympic Association chief executive Tim Hollingsworth said the GB team's performance in Rio was no fluke, but the figures still make very impressive reading. The team, often described as the strongest ever and the best prepared, won 12% of the total number of gold medals available - the best since way back in 1968, a completely different era in Paralympic sport. Rio Paralympics medal table: How did each country do? Finishing second in the medal table behind China, they set 49 Paralympic and 27 world records. Both the oldest (Anne Dunham) and youngest (Abby Kane) competitors on the team claimed medals, and 11 sports won gold medals with a record-equalling 15 securing at least one medal. Yes, the total may have been different if the Russian team had not been banned from competing, but you can only beat what is in front of you, and this was a truly spectacular performance from the 264-strong squad. This GB team has set a new standard and as one Games closes, plans for the next summer Games in Tokyo are well under way. Now the challenge will be to maintain momentum and rise to the occasion once again in 2020.